“No matter what, make sure that you sign up for Random Walk.” This was the one piece of advice that my friends who were Booth alumni gave me when I decided to go to Booth. They set what I believed to be unachievable expectations that this trip would introduce me to some of my closest friends and provide an extraordinary insight into another culture. One week, twelve friends, and three cities later, I understand how transformative my Random Walk experience truly was. 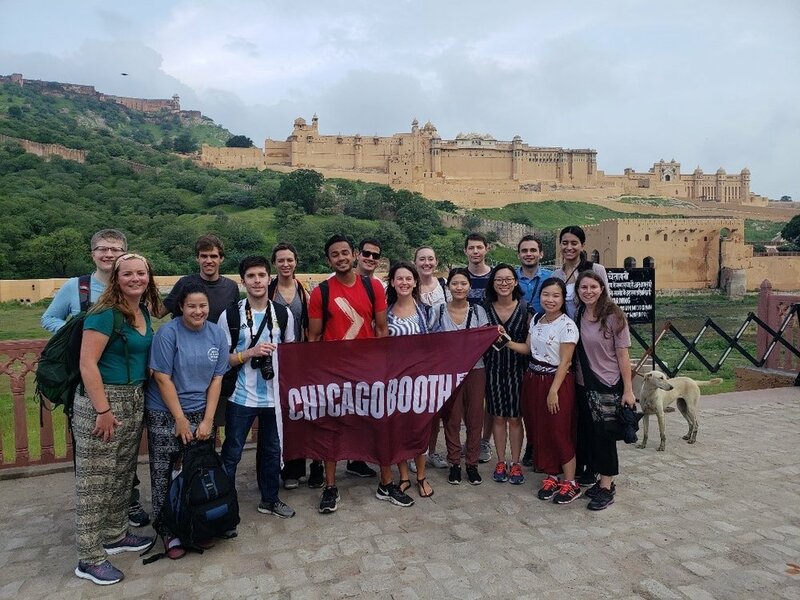 The group, photobombed by a dog in Jaipur, with Amer Fort looking on in the background. I chose to go to India in part because I wanted to be pushed out of my comfort zone. India provided a window into another world, with each city introducing new culture, architecture, food, and history. In addition to the stereotypical cows in the streets, India’s daily routine included ample street vendors, stray dogs, and my Random Walk’s personal favorite, hundreds of goats paraded in the streets and sidewalks in preparation for Eid al-Adha. On our tour, we had the opportunity to explore diverse historical and religious landmarks that demonstrated devotion to religions, rulers, and even love. These landmarks included the Taj Mahal, Amber Fort, Jama Masjid, Jaipur Palace, and the Akshardham Temple. Customary Taj Mahal snap of the Author with Julia Wong and Madeline Vuong. One of the most memorable cultural immersions was a dinner at a local family’s home in Jaipur. The dinner was held in a traditional Rajasthan house, which was designed with central outdoor courtyard surrounded on three sides by the physical home and one side by the entranceway. Our hosts welcomed us with stories of life in Jaipur and the most delicious Indian food I may ever eat, all of which was homecooked by the family. I was fascinated by the family’s demonstration of cooking daal and pakora; the vibrancy of the colors of their spices and the aromas of the fresh vegetables remain in my memory. During the meal, we spoke with their sharp-witted thirteen-year-old daughter as she described traveling through her neighborhood with the family’s guards and her mother, who enthusiastically shared local remedies for improving our health. This experience introduced me to what life in Jaipur may look like away from the common tourist sites. Although I loved exploring this country that is rich in culture, my favorite part of the trip was the people I met. I distinctly remember meeting many of my fellow Random Walkers the evening before left for India and thinking, “Well, they seem nice, but I can’t believe I’m about to go to another country with a large group of strangers.” The feeling that we were strangers quickly dissipated as we bonded over our thirteen-hour flight, discovered each other’s hidden talents, and shared rickshaw rides through Old Delhi. I am grateful for the relationships that I cultivated on this short trip, and am excited to go through my Booth journey with my now-not-so-new friends by my side.